This is a deep fried delicacy made at our homes especially when we are expecting a lot of guests. This recipe is easy to make and the Kunuku remains crispy and tasty even when it cools off. The ingredients are the same as Adai except that the Kunuku batter should be thick. Soak the Rice and Dals separately for 2-3 hrs. Drain the Rice and grind it coarsely along with the Red chillies, Asafoetida and Salt and keep the ground mixture aside. Now drain and grind the soaked dals coarsely and mix it with the ground rice mixture. 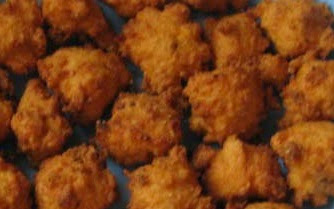 The Kunuku batter should be thick like the Paruppu vada batter. Add the chopped curry leaves to the batter and mix well. Heat the oil in a Kadai. When the oil is hot, spoon the batter into the oil. Once it turns golden brown, remove the Kunuku with a slotted spoon and drain the excess oil on a paper tissue. Kunuku is ready to serve!